We'll refer to the Social Security and Medicare taxes collectively as federal employment taxes. Suppose your sole proprietorship is expected to generate net SE income of $200,000 in 2017. Your SE tax bill will be $21,573 [($127,200 x 15.3%) + ($72,800 x 2.9%)]. That's a sizable amount — and it's likely to get bigger every year due to inflation adjustments to the Social Security tax ceiling and the growth of your business. 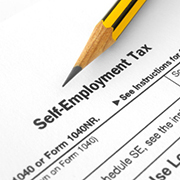 To lower your SE tax bill in 2017 and beyond, consider converting your unincorporated small business into an S corporation and then paying yourself (and any other shareholder-employees) a modest salary. Distribute most (or all) of the remaining corporate cash flow to the shareholder-employee(s) as federal-employment-tax-free distributions. Here's why this SE tax-saving strategy works. The employer then pays in matching amounts of Social Security tax and Medicare tax (other than the additional 0.9% tax) directly to the U.S. Treasury. So the combined FICA and employer rate for the Social Security tax is 12.4%, and the combined rate for the Medicare tax is 2.9%, rising to 3.8% at higher income levels. These are the same as the SE tax rates. That's the bad news. The good news is that S corporation taxable income passed through to a shareholder-employee and S corporation cash distributions paid to a shareholder-employee aren't subject to federal employment taxes. Only wages paid to shareholder-employees are subject to federal employment taxes. Assume the same facts as the previous example, except this time you operate your business as an S corporation that generates net income of $200,000 before paying your salary of $60,000. (Assume you could find somebody to do the same work for about that amount.) Only the $60,000 salary amount is subject to federal employment taxes, which amount to $9,180 ($60,000 x 15.3%). That's significantly lower than you'd pay as a sole proprietor ($21,573). However, you can help minimize the risk that the IRS will successfully challenge your stated salary amounts if you gather objective market evidence to demonstrate that outsiders could be hired to perform the same work for salaries equal to what you're paying shareholder-employee(s). So, the lower the salary, the lower the maximum contribution. However, if the S corporation sets up a 401(k) plan, paying modest salaries won't preclude generous contributions. Converting an existing unincorporated business into an S corporation to reduce federal employment taxes can be a smart tax move under the right circumstances. That said, consult your tax advisors to ensure that all the other tax and legal implications are considered before making the switch. If you currently operate your business as a domestic limited liability company (LLC), it generally isn't necessary to go through the legal step of incorporation in order to convert the LLC into an entity that will be treated as an S corporation for federal tax purposes. That's because the IRS allows a single-member LLC or multimember LLC that otherwise meets the S corporation qualification rules to simply elect S corporation status by filing a form with the IRS. However, if you want your LLC to be treated as an S corporation for calendar year 2017, you also must complete this paperwork by no later than March 15, 2017.